Manage Create and Monitor Your Tasks in a Complete System - Receive Reminders and Mark as Complete. For a 14-Day Free Trial, click here! Full Featured Task Management Software Designed to Manage and Streamline Your Entire Business from Start to End. A system to notify you of your general or section specific tasks. Eworks lets you set up task types. This allows you to categorise your tasks and lets you know exactly what you need to do if the task has been created for you by a colleague. Within our Leads section, our software for Task Management helps the sales team set up tasks for themselves. These could vary from meetings to demos and call backs. These notifications can create a pop-up alert to make sure you never forget that important call or email. Upload attachments such as site documents or user manuals against the lead and when converted to a quote the attachment will be automatically synced through. Once the quote is accepted and converte3d to a job the attachment will be synced to the job for your mobile user to view on the job. Tasks can be set up against a specific quote. You can notify yourself or another member of staff when creating a task. When the notification message pops up at the time selected when the task was created, the quote reference will be visible so that you or your college will know which quote the task relates to. Whether a job is currently in progress or complete, you can create a task against it to remind yourself or a college to do something around the job. When the notification runs, the job number will be visible in the notification so that you know what the task relates to. Within the invoices section, whether the invoice is in draft, is outstanding or overdue, you can create a task against it. This will be a handy reminder to send an invoice to a customer in time, monitor a specific invoice that’s still outstanding or chase up an invoice that’s overdue. 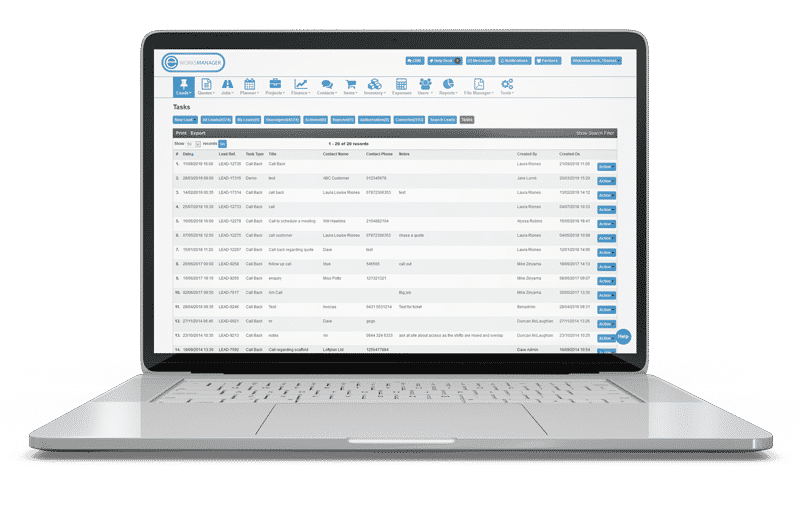 Create a task within a purchase order, whether you haven’t sent it to your supplier yet, or you are still waiting for approval. This will ensure the system notifies you to send it for approval as soon as possible or remind your supervisor or manager to approve urgent purchase orders. Eworks lets you create a general task in the system which is independent and not linked to any specific section. In the case where you would like to set up personal reminders such as birthdays or events or you would like to let your colleague know you have scheduled and inhouse meeting.